As much fun as the Jackbox collections always are, inevitably you find that they tend to include one or two mini-games that feel like filler. The first Jackbox pack had Word Spud and Lie Swatter, Party Pack 3 had Guesspionage, and Jackbox Party Pack 4 featured the baffling Monster Seeking Monster. It’s no surprise, then, that Jackbox Party Pack 5 includes a couple of duds. What is surprising, however, is that one of these duds is You Don’t Know Jack — which, after all, is the series that put Jackbox on the map. Okay, “dud” may be putting it a little strongly. After all, despite its Netflix-y theme (proper title: You Don’t Know Jack: Full Stream), it’s more or less the same YKDJ that has been around for decades. It’s still got Cookie Masterson doing his snarky hosting, it’s got Dis or Dat, it finishes up with a Jack Attack: in every way that matters, it’s the same as the YKDJs that have come before it. But that may also be the problem. Because it’s basically like all of its predecessors, it feels like a relic from a twenty years ago. Not only that, it feels kind of out place on a Jackbox Party Pack. Whereas much of the humour in the other games on Jackbox Party Pack 5 (and 4, and 3, and 2) comes from your fellow players and how they react to the prompts on offer from the game, in You Don’t Know Jack: Full Stream the humour only goes one way. There’s nothing wrong with that, and the writing is as strong as its ever been, but given the choice between playing trivia or engaging in robot rap battles (more on those in a moment), I’m going to pick the robots every time. There are fewer excuses to be made for Zeeple Dome, Jackbox Party Pack 5’s physics-based combat game that feels even less like what you’d expect from anything in a Jackbox Party Pack. Taken on its own, there’s nothing really wrong with it — you’re using your phone to fling your character around the screen, taking out enemies and picking up power-ups. In the context of a game that prizes creativity and that’s easy for anyone to pick up and figure out instantly, however, it sticks out in a bad way. It feels more like a solo mobile game from the early days of App Store gaming rather than a hilarious party game, and if I’m being totally honest, it’s my least favourite entry on Jackbox Party Pack 5. It’s a sign of how good the other three games are, then, that even with one dud and one decent game that feels totally out of place, Jackbox Party Pack 5 is still work checking out. The first of the bunch, Split the Room, features players voting on hypothetical situations in a Twilight Zone-themed game hosted by a talking cat. It’s less funny than most Jackbox Party Pack games, but it’s no less enjoyable. Trying to come up with weird hypotheticals that will, as the game’s name suggests, split the room requires no shortage of creative thinking, as well as insight into how your friends would respond to weird situations — things like would you get a face tattoo that said something scandalous or weird if you’d get $2,000 a week for life, or would you give something up in exchange for getting an inheritance that would mean you’d never have to work again, or who would you rather avoid all eye contact with for the rest of your life? It may not sound like much on paper, but with the right group it can spur all kinds of debate and discussion. There’s also Patently Stupid, a game that allows players to indulge their inner inventors by coming up with solutions for ridiculous problems. It comes off as a twisted version of Dragon’s Den (or Shark Tank, depending on your cultural touchstones), particularly when it comes time to sell your fellow players on your idea using drawings, names, and taglines. Again, the joy of the game comes from selling your friends on ridiculous ideas — along, of course, with terrible, terrible drawings. The best game of Jackbox Party Pack 5, however, has to be Mad Verse City. It features rapping robots spitting Mad Libs-inspired rhymes at each other in rap battles, and it’s as glorious as it sounds. In fact, much of fun comes from when things don’t go smoothly, like when you’re watching on-screen robots struggle with text-to-speech software — mispronunciations are inevitable and hilarious — or when someone can’t think of a rhyme and the game simply gives you gibberish instead. Like other great Jackbox games, Mad Verse City works because it gives players tools to be creative, and then mostly gets out of the way. Mind you, it’s no Fibbage, Survive the Internet, or Tee KO. And that’s why Jackbox Party Pack 5 isn’t quite on par with its predecessors. It’s a solid party game, to be sure, and if you’ve played Packs 2, 3, and 4 as much as I have you’ll be welcoming the new game options, but it’s not quite essential. Then again, “solid Jackbox party game” is still better than pretty much any other party game you could come up with — and for that reason, Jackbox Party Pack 5 is still a worthy addition to the Jackbox canon. 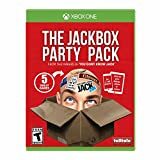 Jackbox Games provided us with a Jackbox Party Pack 5 Xbox One code for review purposes.